A novel fully electrified car and passenger ferry will help efforts to decarbonise maritime transport. It will also overcome limitations in distances for such boats by targeting medium-range connections. Cruise liners, ferries, tankers and freighters are a significant source of CO2 emissions and other pollutants. The international shipping industry currently emits around 1 000 million tonnes of CO2 annually, based on a report by the International Maritime Organization. This amounts to about 2.5 % of global greenhouse gas emissions. To reduce reliance on diesel and heavy fuel oil that power a majority of such vessels, shipbuilders are increasingly focusing on developing hybrid and electric ships. Enter the EU-funded E-ferry project that will soon launch a 100 % electric, emission-free, medium-sized ferry for passengers and cars, trucks and cargo. It will travel longer distances than previously seen. As stated on the E-ferry project website, the new ferry goes beyond current limitations of similar efforts targeting medium-range connections, and is likely to have the largest battery pack ever installed in a vessel. "The peak charging power of the E-ferry battery pack and its shore charging connection will be up to 4 MW." The E-ferry project's boat will be able to cover distances of over 20 NM between charges. In comparison, contemporary electric ferries like the Norwegian Ampere cover only about 3 NM, according to the project's periodic report on CORDIS. 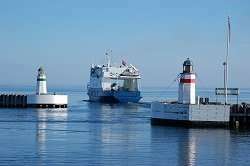 It also states that the E-ferry will reduce the island of Aeroe's annual emissions with approximately 2 000 tonnes of CO2. "Moreover, the implementation of the E-ferry will mean lower operating costs (running costs) for the operator, as well as reduced travel time for passengers, when compared to the existing conventional diesel ferries that are currently in operation on the island." The E-ferry will be put into operation on the routes between Soeby-Fynshav (10.7 NM) and Soeby-Faaborg (9.6 NM) in the Danish part of the Baltic Sea, connecting the island of Aeroe (Ærø ) to the mainland. The same report notes that the socioeconomic and environmental impact of the E-ferry is expected to go far beyond the island "as there are numerous communities in Europe (and internationally) that are currently served by conventional ferries that cover similar distances to the E-ferry." The ongoing E-ferry (E-ferry – prototype and full-scale demonstration of next generation 100% electrically powered ferry for passengers and vehicles) project was set up with the overall objective of applying a newly developed, energy-efficient design concept. It also aims to develop a business case and model, and prepare the concept for market uptake starting soon after the end of the demonstration period. As specified by the E-ferry website, the objective beyond the project duration is to reach a level of approximately 10 more E-ferries in operation in Europe "and worldwide every year reaching a total of 10 or more by 2020, 100 or more by 2030 thus saving (in rough figures) 10-30 000 tonnes of CO2 annually by 2020 and 100-300 000 tonnes of CO2 annually by 2030."